Poster has a burgundy and white photograph of two women in the center looking at a book. One woman has on a military uniform the other is in ethnic dress. Along the side are two yellow and burgundy photographs of women. 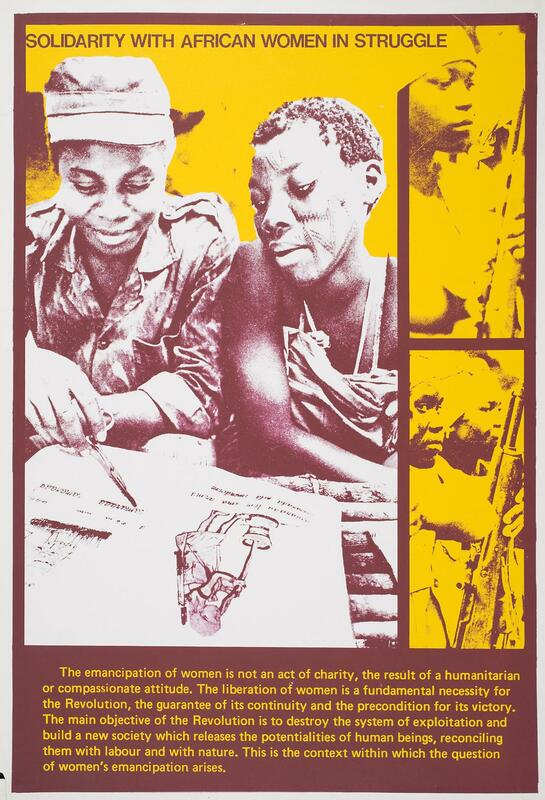 The top reads, "Solidarity with African Women in Struggle." The bottom edge has yellow text that reads, "The emancipation of women is not an act of charity, the result of a humanitarian or compassionate attitude. The liberation of women is a fundamental necessity for the Revolution, the guarantee of its continuity and the precondition for its victory. The main objective of the Revolution is to destroy the system of exploitation and build a new society which releases the potentialities of human beings, reconciling them with labour and with nature. This is the context within which the question of women's emancipation arises."